A research team has created an AI device that can identify objects at the speed of light. It is a physical neural network that can analyze vast amounts of data. It can also identify things incredibly fast. 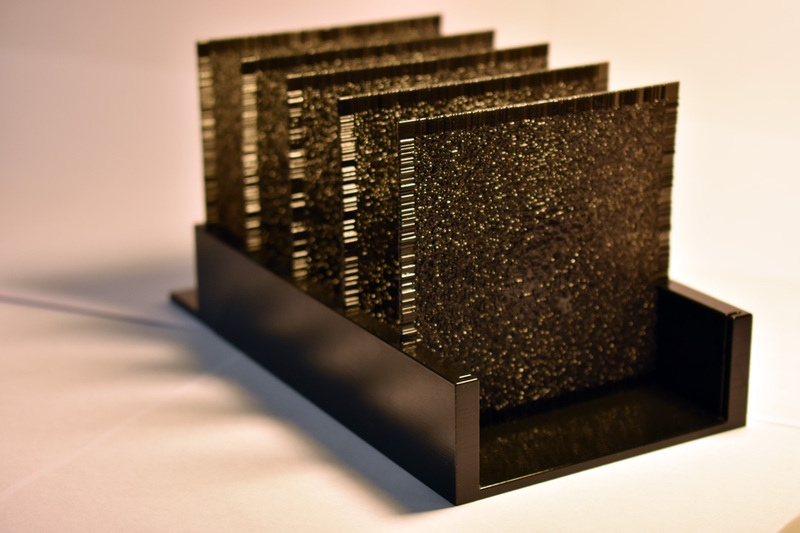 The researchers created the AI device using a 3D printer at the UCLA Samueli School of Engineering. AI stands for artificial intelligence. Intelligent machines that work and react like humans have artificial intelligence. AI can, for example, recognize human speech, learn, and plan. Many AI’s can also solve problems. Aydogan Ozcan and colleagues wrote about this latest study and its achievement in the journal Science (citation below). Automation, a technique, method, or system of operating a process by highly automatic means, uses computers and AI. Automation is changing how many factories today operate. What is/isn’t an AI device? Computerized cameras that identify objects exist in several devices that we use. For example, ATMs can ‘read’ human handwriting when people deposit a check. There are also Internet searches that rapidly match photographs to other similar pictures in their databases. However, they are not AI devices or systems. Their systems rely on a piece of equipment to image the intended object first by ‘seeing’ it with an optical sensor or camera. It then processes what it saw into data, and finally uses computer software to determine what it is. The AI device that UCLA engineers developed gets a massive head start. Its ‘diffractive deep neural network‘ identifies an object as quickly as other devices take to just ‘see’ it. This new AI device uses light bouncing from the object to identify it. It doesn’t need software to process a photograph of the object and determine what it is after its optical sensors pick it up. The device does not consume any energy either. It just uses diffraction of light. The network consists of a series of 8 cm2 polymer layers. It works using light that goes through it. The technology in this device has potential for many different types of tasks that require sorting and identifying objects. It is especially useful for speeding up data-intensive tasks. A driverless car, for example, could react instantaneously if it used this technology. In fact, it would react even faster than it does with current technology to, for example, a stop sign. A device based on the new technology would read the stop sign immediately. In other words, it would ‘read‘ it as soon as it received the light from the stop sign. Having to wait for the car’s camera to take a picture of the object, and then determine what it is, takes much longer. This latest technology also has potential applications in medicine and microscopic imaging. It could, for example, sort through millions of different cells looking for signs of disease. It all began, i.e., creating the artificial neural network for the AI device, with a computer-simulated design. With a 3D printer, the researcher then created extremely thin, 8cm2 polymer wafers. The surface of each wafer is uneven. The unevenness helps diffract light coming from it in different directions. To the naked eye, the layers look opaque (not transparent). However, submillimeter-wavelength terahertz frequencies of light can travel through them. This is the type of light the researchers used in their experiments. Also, each layer consists of tens of thousands of artificial neurons. In this case, they are tiny transparent pixels. In other words, light can travel through them. The series of pixelated layers together work as an ‘optical network.’ The network shapes how light, when it comes in, travels through them. Most of the light that comes from an object is diffracted toward a single pixel. That is how the network of the AI device identifies an object. The single pixel is assigned to that type of object. Using a computer, the researchers trained the network to identify objects in front of it. It learned the pattern of diffracted light coming from each object. Therefore, when the light passed through the device, it knew what the object was. The researchers used ‘deep learning’ so that the AI device could improve. Deep learning is a branch of artificial intelligence in which devices learn through repetition. Eventually, over time, patterns emerge. They learn from those patterns. The researchers demonstrated that the AI device could identify handwritten numbers accurately. It could also identify items of clothing. In studies, researchers commonly use handwriting and items of clothing when testing AI devices. They placed different images in front of a terahertz light source. Then, they let the AI device ‘look at’ or ‘see’ them through optical diffraction. Ozcan and colleagues also trained the AI device to act as a lens. Specifically, a lens that projects images of objects placed in front of the optical network to the other side of it. This is similar to how typical cameras work. Unlike typical cameras, however, it uses artificial intelligence rather than physics. The researchers can create its components with a 3D printer. Therefore, they can make the artificial neural network with bigger and extra layers. This means that they can make devices with hundreds of millions of artificial neurons. The large AI devices could identify a huge number of objects simultaneously. They could also perform much more complex data analysis. The AI device is amazingly cheap. In this study, the researchers could reproduce it for less than fifty dollars. In this case, the AI device used light in terahertz frequencies. However, it would also be possible to make neural networks that used infrared or visible light. In fact, there is no reason why we could not produce a network using lithography or other printing techniques. The Howard Hughes Medical Institute and the National Science Foundation funded the study. 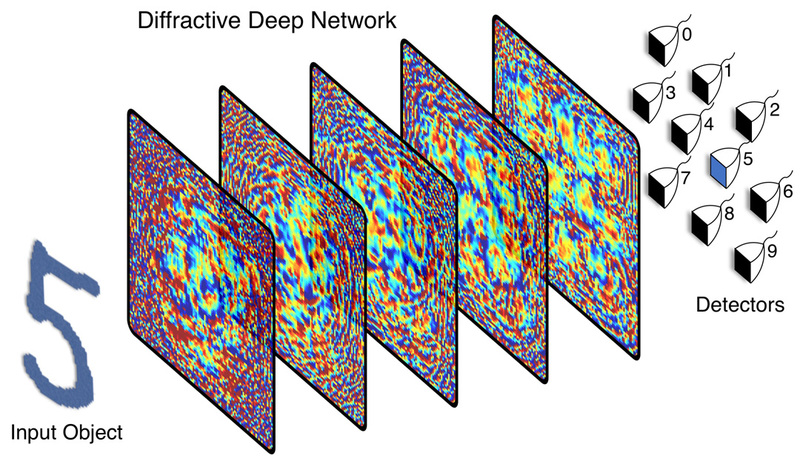 ‘All-optical machine learning using diffractive deep neural networks,’ Xing Lin, Yair Rivenson, Nezih T. Yardimci, Muhammed Veli, Yi Luo, Mona Jarrahi, Aydogan Ozcan. Science, 26 Jul 2018: eaat8084. DOI: 10.1126/science.aat8084.